Work commenced in June 1863 under a contract for the basement. In November of the same year the contractor failed and the work was stopped. In June 1865 it was re-commenced under a fresh contract and it was nearing completion in 1869. 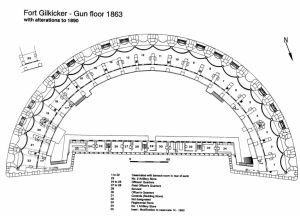 By this time the plans had been revised (in 1867) to allow for iron shields in the casemates and for iron shields to protect five guns which were to be mounted on the roof. The fort was completed in 1871. The contractor was a Mr Leather, the same contractor who built the Spithead sea forts of No Mans Land, Horse Sand and Spitbank. The new fort consisted of a high granite wall, semi-circular in shape, facing the sea. This wall was pierced on the seaward side by 22 arches filled in with iron shields. Each shield had an embrasure for a gun which was mounted in a casemate behind. 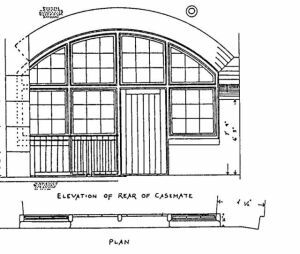 Each casemate was approximately 35 feet long and 18 feet in width. The rear portion of each casemate provided accommodation for the gun‘s crew and was fitted with the usual barrack room fittings. 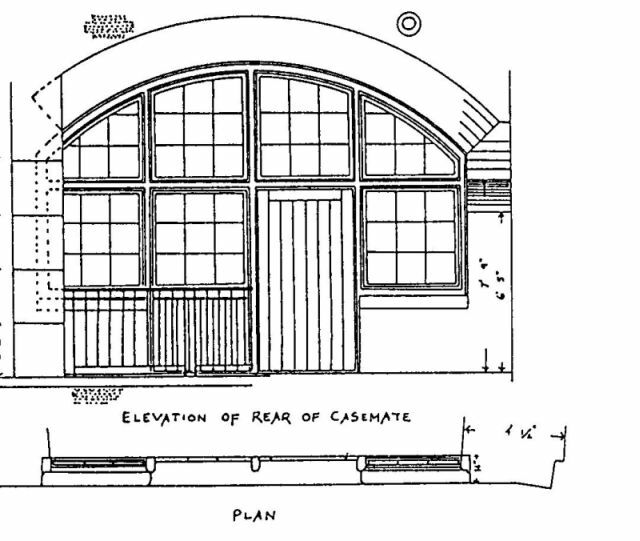 Each casemate had a fireplace which was supplied with its own fresh air inlet. 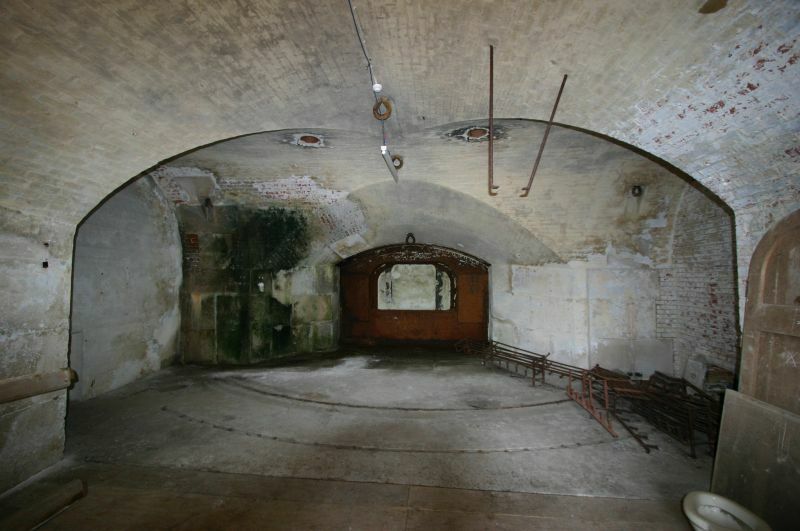 The rear of each casemate was closed off with a wood and glass partition in the centre of which was a door. Each casemate led out on to a veranda which ran the whole length of the rear of the casemates. An iron railing ran along the rear of the veranda. The pillars of the veranda also served as chimney stacks for the casemates. On the veranda outside casemates 1, 5, 18 and 22 was a sink and tap. The veranda was connected to the ends of the barrack block by a balcony. From the veranda steps led down to the parade. 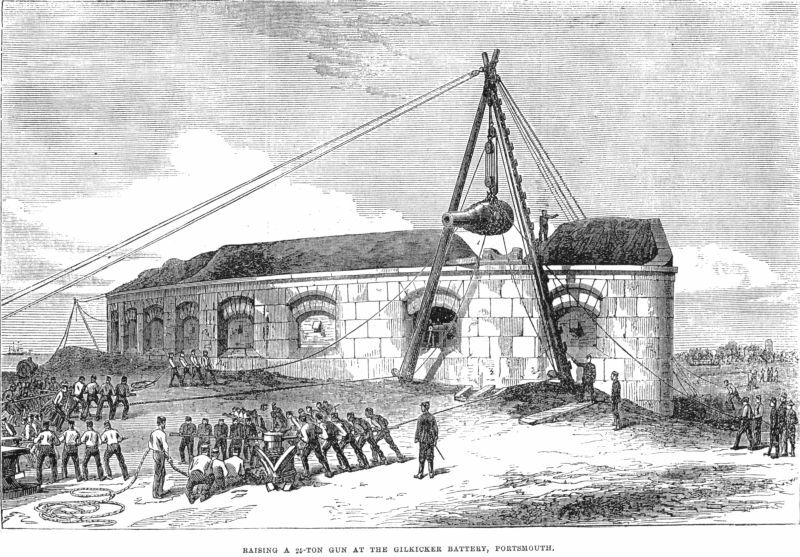 The whole of the fort was 400 feet across and 150 feet from front to the rear of the barrack block. A defensible barrack block closed off the rear of the fort and provided accommodation for the officers of the peace time establishment which consisted of 5 officers, 4 sergeants and 98 men. The barrack block was loopholed to the rear to provide local defence. Each loophole was provided with a sliding shutter to close it off when not in use. The building was of brick which was rendered completely in the early 1900s. The roof is flat and was provided with what appears to be a firing step to allow defence against landward attack. It was sealed with asphalt and had a York stone coping. Two reserve fire tanks each holding 3,500 gallons were positioned on the roof. In later years, possibly after the Second World War, these were removed and the roof was covered with sloping corrugated iron sheets because of leakage. Access to the fort was through a tunnel in the centre of the barrack block. 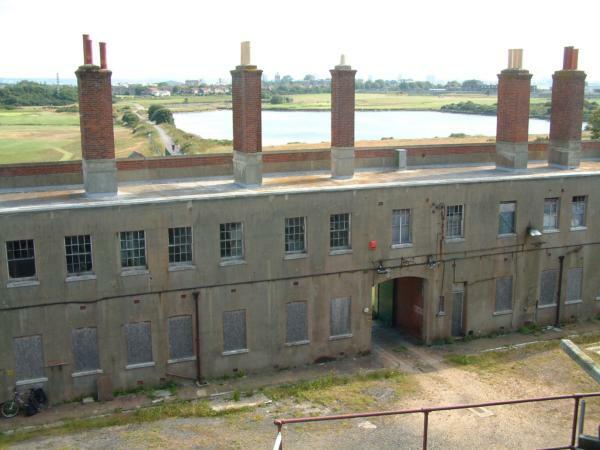 According to the plans Gilkicker was built to house 1 Field Officer and 4 Officers with 220 NCOs and privates. 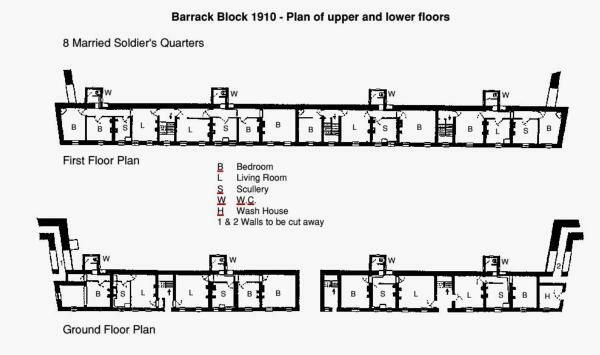 The upper floor of the barrack block consisted of, from west to east, artillery store no. 1, regiment stores, bedding store, officer‘s quarter, officers servant‘s quarter, field officer‘s and officer‘s quarters and finally artillery store no. 2. 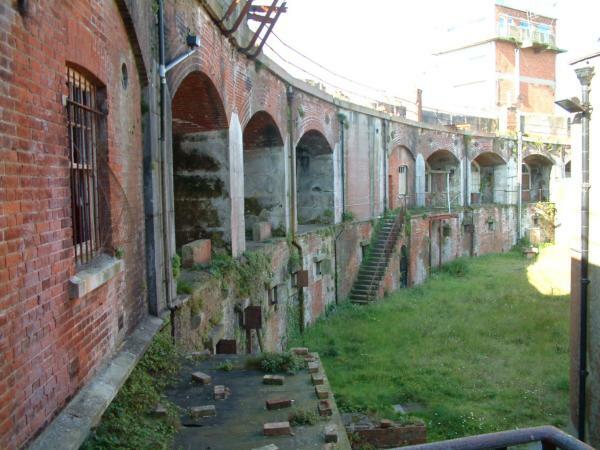 Each of the two artillery stores, being at the ends of the barrack, led out onto the balcony connecting with the veranda of the casemates. No access was possible from the barrack itself. On the landing at each end a ladder gave access to the roof. The ground floor, from west to east, included cartridge filling room no. 2, shell filling room no.2, latrines, ablution room, cookhouse, lock up guard room, access tunnel, an officer‘s quarter, servant‘s quarter, officer‘s mess room and kitchen, pantry and at the extreme east end a tool room and cartridge filling room no.1. 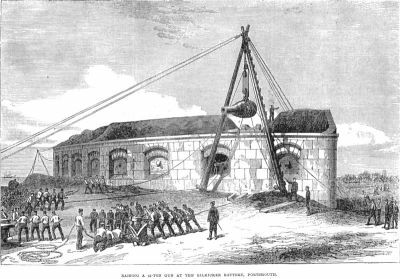 Fort Gilkicker: Elevation of rear of barrack casemate. 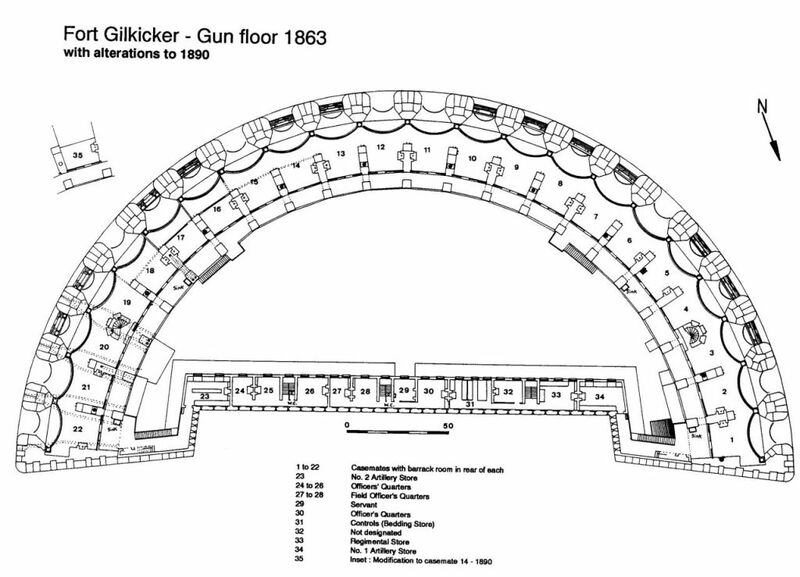 Fort Gilkicker: P1an of Gun floor 1863.